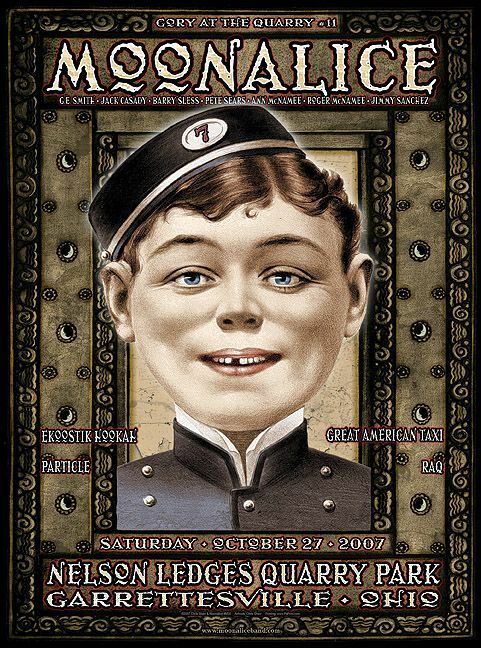 According to Moonalice legend, Halloween falls at the end of October because it's too cold in November to go door-to-door for candy. In some parts of North America even October is too late. The tribe in Ohio lobbied for years to move Halloween into July to optimize both the weather and the hours of daylight, but they were overruled by the forces of tradition. Too bad. Nelson Ledges Quarry Park is beautiful. On this day, it was cold and rainy, which was hard on our fingers, but had zero impact on the audience, whose enthusiasm and costumes reflected their Moonalice heritage.